One of the perks of being on a “flexible” schedule (sometimes called retirement, or unemployment in my case) is the ability to offer help. Hanni and B’s cabin is on an amazing property that also happens to be for sale. 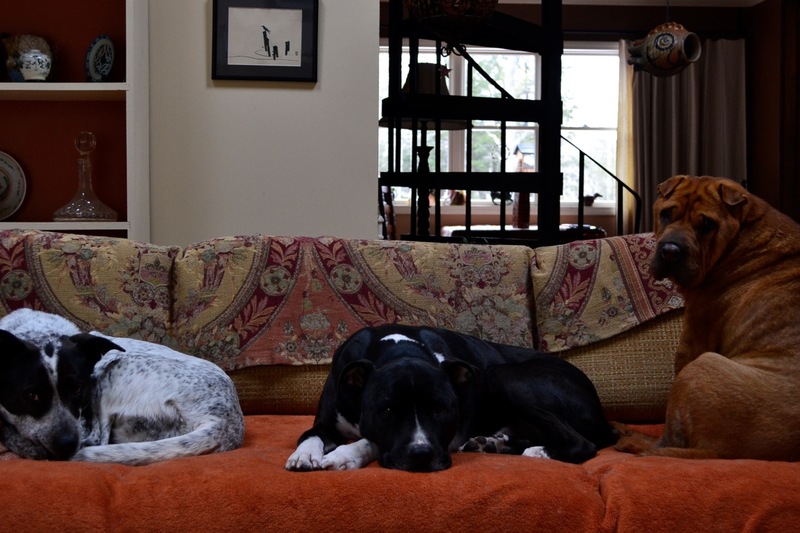 They are not concerned about the lease but when the house is shown to prospective buyers, the dogs need to find a home for the day. The “cousins” as I call them were here for two days last week. Everyone got along exceedingly well and Alice’s toys survived. Skeedles the cat would disagree since she spent all Monday in my loft office glaring down at the canine capers and all Friday outside. PAY ATTENTION TO YOUR HUSKY! At 2, Gaia is the baby. We work on manners, as they rush expectantly and pile up in a lump of legs before the door. I assume my Drill Sargent voice and command they sit and wait. 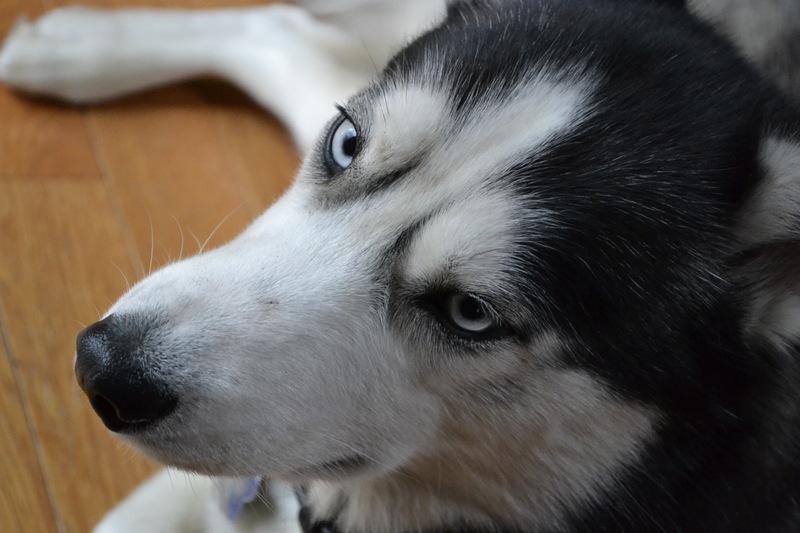 The husky throws back her head and softly howls, overruling my speech with “Oh but why?? ?” or maybe she is just laughing at me. They burst into the yard when released, a flurry of 16 feet and four tails pounding down the decking only to freeze in mid-dash and survey the yard with noses tilted to the wind. This entry was posted in memoir. 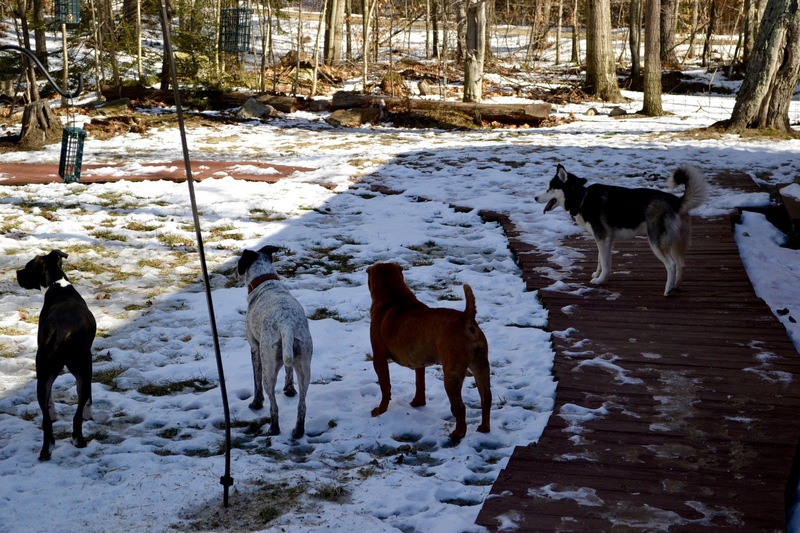 Tagged doggie day care, dogs, humor, life after 60, life in NH, life with dogs, memoir, pets. Cute! Another short story, perhaps child’s book in the making if I ever heard one! Excuse for not being on the subject at hand, but do you know of any publishers that would be willing to publish a book of religious poetry? It’s a 162 page collection of religious poetry, and we’ve been looking for a publisher for so many years, i can’t keep with how long it’s long it’s been. Just give me a publisher and their e-mail, that’s all i ask. She seems to take it in stride, perhaps knowing they are temporary. Even when they lived here for a month last summer, she made adjustments. Funny old cat. Good thing everyone gets along! 6 different personalities (including you and Skeedles) is a lot to manage. 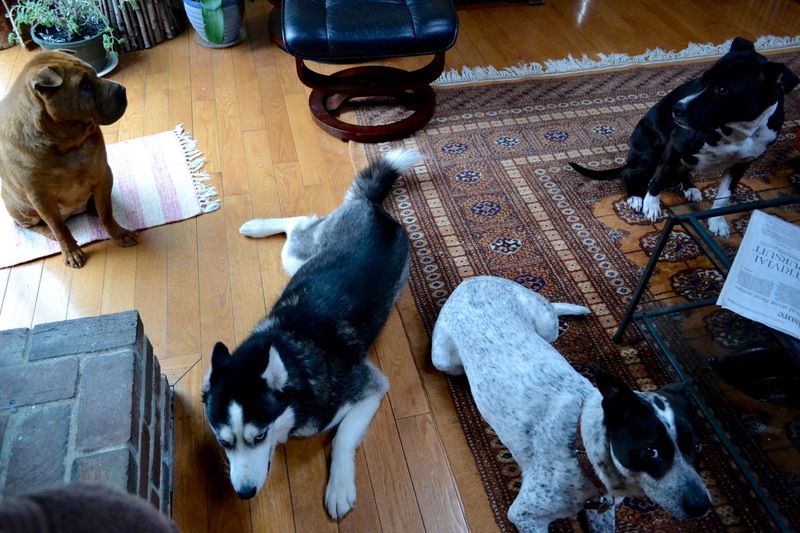 Love the picture of the pack on the rug. Dogs in a group do sort of swirl around you when there’s a door or gate. WInd is worth the time to sniff and feel on your skin..we do that far too little, I think. Dogs know nose. True wisdom, stop and smell the wind, or the poop or whatever! I’ve only ever had one dog at a time. I can’t even imagine having four! I don’t think I could have 4 all the time but every once in a while it is really fun. Fours dogs sounds like a handful, especially for one little cat! If you look at it from the cat’s point of view it is several handfuls! From the dog’s point of view? Living in the moment.